Some years ago I published a diagram about MPLS trying to explain how it works in a simple way. 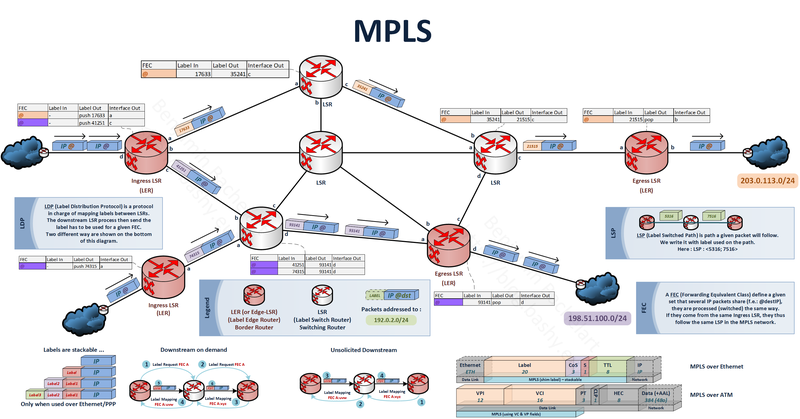 This diagram was in French so now here an English version, I added some MPLS table as example, It may be useful. Case of MPLS several shim label is though not shown nor explained in this diagram. Ce contenu a été publié dans Réseaux, avec comme mot(s)-clé(s) English, MPLS, Network. Vous pouvez le mettre en favoris avec ce permalien.